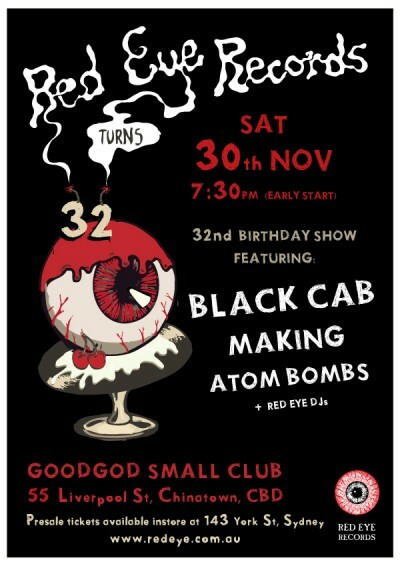 Red Eye Records turns 32 this November – So we’re throwing them a Birthday Party! Shape-shifting Melbourne outfit Black Cab make a rare trip to Sydney for the night. Over the course of 3 LPs and a slew of singles, they’ve covered raunchy psychedelia, cosmic electronica and brooding rock soundscapes, recalling greats such as krautrock pioneers Neu & Can, deconstructed NYC duo Suicide, and local heroes Underground Lovers. Performing in full band mode with accompanying projections, they’ll be previewing songs from their upcoming album inspired by the 1976 Montreal Summer Olympics. Super-tight Sydney trio Making veer from spectral soundscapes to precise, bile-heavy, minimalist rock. Having self-released an eponymous EP and a couple of singles, they’ve very much become local favourites. Always a treat to see live. Kicking things off on the night are grimy instrumental surf-guitar combo Atom Bombs. Loaded with blistering riffs laced with ambient psychedelia, these party-starters wear their ‘birth of surf’ influences on their sleeves. And they’ve got the hits! “Ballad of Barracuda”, “Gorilla Grip”, “A.T.O.M” … arrive early.